Playing in its last true road stand of the season, the No. 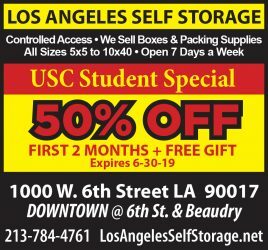 4 USC women’s volleyball team, led by senior outside hitter Alex Jupiter, swept No. 20 Oregon and Oregon State en route to a perfect 6-0 record last weekend. Coupled with No. 1 UCLA’s loss to the Ducks (18-8, 11-7), on Friday, the Women of Troy (22-4, 17-2) are now alone atop the Pac-12 standings. In front of an energized Oregon crowd, which waited until 8:30 p.m. to watch the match Saturday, USC came out of the gates on fire, catching the Ducks off-guard en route to 21 kills in a 25-21 first set. Shaw finished off the 3-0 sweep with the last of her career-high 17 kills to end the third set, beating her previous high of 15 in a game. Along with Shaw, Jupiter, who has been rewriting the USC record books this season and is slowly approaching the school’s all-time kills record held by Jennifer Kessy with 1,799, put in another stellar all-around performance Saturday. With 21.5 points on the match, which included a career-high five service aces and 14 kills, Jupiter was the focal point of the team and her serving turned the tide of the third set. Senior setter Kendall Batman has also played a key role in USC’s offensive surge. Bateman leads the Pac-12 with 12 sets per game, but she has recently been averaging more than 15 per match and has been the key facilitator for the Women of Troy attack. Oregon, which was led by Alaina Bergsma with 13 digs, three aces, and five digs, seemed to do anything in their power to hit away from sophomore libero Natalie Hagglund and she actually failed to register a dig in the first set. 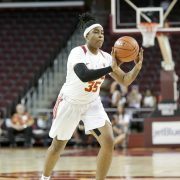 On Friday, the Pac-12-leading Women of Troy faced off against a stout Oregon State squad. The Beavers hung tight with USC in the first set as it was deadlocked at 16. But the Women of Troy staved off Oregon State after senior middle blocker Lauren Williams’ kill, and a block and kill by sophomore middle blocker Alexis Olgard pushed USC to close the first set out. The Beavers opened the second set strongly, taking an early 5-1 lead, but the Women of Troy responded with an 8-4 run of their own to knot it at nine apiece. But USC closed the second set on an 11-4 run to take a 2-0 lead in the match. Schraer had almost as many blocks in the third set as USC had the entire match in helping the Women of Troy to victory. Defense at the net has been a point of contention for Haley this season.